woodworking from their parents and were really skilled at building or using their hands. Nearly everyone work on a project in their spare time. Today things look different and few people know how to work with wood or are even willing to start their own project. They just call in a professional. This may even be because of lack of time. Not that people had more time in the past but they didn’t have as many things to fill their time with. These days there are so many possibilities in place of working with your hands that many men don’t even think about trying until their have children and would like to build them a treehouse or fort to play in. However, today with all the assistance of the internet. It wouldn’t take a lot to gain knowledge of how to build something. 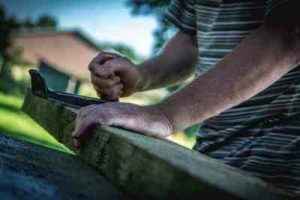 You may not have a father or grandfather to teach you so you may need to practice to become skilful but it can still be a lot of fun and very rewarding to build something all by yourself. These days you can find plans for all sorts of projects on the internet. Make sure you start with a blueprint of what you are wanting to build and these usually will show what you will need to know before you start. this allows you time to practice your skills before beginning on the actual project. You will need to start with some basic tools. It is always best to buy the best your budget will allow for good results. Cheap or shoddy tools can cause you trouble and make the job a chore instead of fun. If you are unsure of which tools you will need and what are the best tools then the internet is a good place to start. Prices are usually much lower as well. Once you have your plan then make a list of the tools you will need to complete it. Then you are ready to order them from the e-shop you can find. The internet allows you to compare prices on various tools and also may give a good description of the quality etc. Articles online are a good place to start to for beginners and they often will give an idea of what tools you may need. Simple guidance like the variety of saws you may need for different purposes. Or what a jig does and how to use it. Remember this is supposed to be fun so don’t get too worked up about which tool to start with because a good blueprint will let you know what to use, when and how. If you take your time to learn the different tools and what they do you will soon be enjoying working with wood and seeing the finished products produced by you alone.